The first step is to know your target audience and identify exactly where they are, doing what, and when. You cannot talk to every one all the time. Insights are far more valuable when they give you specifics on a certain target audience. Otherwise, it's information, not insight. Fence in the customer, or consumer, that you want to know about. Your insight strategy could be targeted by location, behavior, social platforms, their visits to your website, reactions to your advertising etc. Who are your customers who visit your home page and jump straight out? Once you know your goal, knowing who you want to find out more about is important. Once you know this target, figure out how you are reaching that segment. Who are you engaging (or not) and where? Your website, social media channels, your paid media reach and results, your email campaigns, your sms, online forums and reviews are all points of engagement that you could check as to where that specific audience is. This is your first step in defining a distribution strategy. Actively Engaged: This is your big fish. These are people who comment, participate in dialog with your brand and with their community about your brand. They Like, they Share, they retweet and re-gram. Usually they will follow you across multiple platforms and are more likely to have an impact on your content than any others. These are the folks you genuinely want to aim your content out, so your content distribution stRategy should be mainly configured to meet these people on their favored platforms and media and at their favored time slots. Passive Engaged: People who follow your brand or product, but do not engage. They view your posts, but move on. They may be just following your brand posts to stay informed on updates, new products etc. They don't Like of Share, they don't Comment. Spectators and Collaterally Reached People are the ones who come across your content quite by chance. Your post may have popped up on their timeline because a Facebook algorithm figured out they may have an interest, they may have seen a share by an actively engaged fan etc. They are not seeking out your content. Develop a distribution strategy that is focused on your target audience behavior. Your content needs to have a clear distribution strategy based on where your target audience is most engaging – with your content, and with similar content to yours. What are the types of content they most engage with? Video? Blog posts? Microblogs like twitter? Which platforms are they on? When are they on? What types of content gets most shared and commented on? All of these factors are essential to configuring your content distribution. Brands often have broad KPIs that they use to measure success. That's wrong. Your content distribution should take into account whether each type of content you have out there targets one of the three types of people in your audience – the active, the passive and the mere spectators. You will need content and distribution to meet all three types. And you need to measure accordingly. Sometimes, visits to your website may be a more relevant KPI or goal than say, Likes on Facebook. Comments on long form content such as blog posts are relevant in measuring success of the actively engaged segments. But counting Likes on brand building posts may not be a good KPI. Do not ignore the relevance of paid distribution channels. Whether through links on ad networks, paid social, or via native content in partnership with publishers, these are important distribution channels. Keep SEO in mind for all your content as well. Relevant content will help you get inbound links to your pages (thus increasing your PageRank), but you need to identify the search terms related to your business, and build content around them– using keywords in the headline and body copy and creating valuable, useful, relevant content across the right platforms for them. 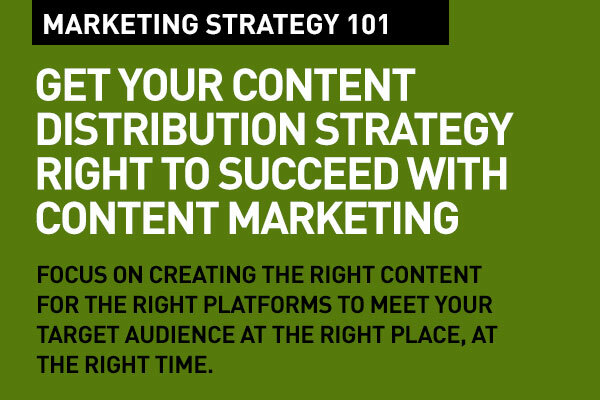 These content distribution strategy tips are useful. Many marketers use one strategy for all types, which, as you mention, is a big mistake. I think a lot of marketers underestimate the importance of distribution strategy. But it’s more important to distribute and promote your content than it is to pump out an endless supply that no one ever sees.